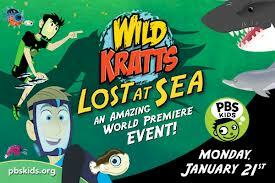 The ABCD Diaries: Wild Kratts "Lost at Sea" Premieres Monday! "PBS KIDS’ popular WILD KRATTS series will have kids and parents diving into a creature adventure on Monday, January 21, with the premiere of a new science special — WILD KRATTS “Lost at Sea.” During the one-hour event, brothers and wildlife explorers Martin and Chris Kratt go under the sea in two new episodes filled with humor, excitement and a whole lot of science. Kids will also be able to explore natural science with the Kratts through new science games and science videos online, and new videos on mobile. In addition, the on-air special will be available on DVD starting January 22. When the miniaturized Kratt bros are swept up and lost in a swath of plankton, they become part of a crowd of fish larvae all headed to the most populated and diverse habitat on Earth — the coral reef. As Aviva and the gang search for them, the lost bros take up residence on the reef alongside a newfound porcupinefish friend, who will hopefully show them how to survive in this fish-eat-fish world until they are rescued. But when Donita shows up searching for a special Sea Crown fit for a fashion queen, the gang must return the favor and rescue their friend. The Wild Kratts team is on a mission to decode the secret language of one of the smartest creatures on Earth — dolphins! With the help of Aviva’s experimental Dolphin Decoder and two young dolphin tutors, Chris and Martin join a pod and try to speak “dolphinese.” But when their newfound friends are caught in a jam with the dolphins’ only true creature enemy — a hungry shark — the bros are embroiled in a hair-raising rescue mission that tests their new creature language skills. The one-hour science special premieres on Monday, January 21, on PBS KIDS (check local listings). A new online science game, “Dolphin Dive,” is the first PBS KIDS online game to include real animal sounds! In the game, players can extend their experience in learning about dolphin communication, as they help the Kratt Brothers use their dolphin Creature Power Suits to reunite lost dolphin babies with their pod. Kids can earn their own dolphin Creature Power Suit and then explore a new Coral Reef Habitat. Players will encounter amazing sea animals, as they swim alongside a sea turtle and shark. “Dolphin Dive” will launch in the coming weeks, joining WILD KRATTS’ collection of popular science games." What we thought: Wild Kratts is our kiddos favorite show on PBS and they were thrilled to participate in this review:) They have watched and re-watched these new episodes over and over and still love them. These shows are so educational, even I learn something with each new episode! If your little ones love learning about animals, these new Wild Kratts episodes are sure to be a big hit. Check out the latest Wild Kratts adventures on Monday! ABCD Diaries gives them an A+!